Dogs, affectionately known as “man’s best friend”, are a wonderful companion for anyone that enjoys adventure. Many dogs are quite comfortable on the water, and can make a perfect (and adorable) kayaking buddy! But before you can set off on your kayaking adventures with your furry friend, you need to find a kayak that is suitable for dogs. Below we have compiled a list of a few kayaks that we believe are the best kayaks available for tandem kayaking with your best, non-human friend! The kayaks that are most suitable for kayaking with a dog are sit-on-top kayaks, as it much easier for the dogs to get in and out of it. Depending of the size of your dog, your kayak does not always have to be tandem, but in saying that, the tandem kayak is absolutely perfect for kayaking with a pet, as there is ample space for the both of you, as well as for all of your gear. 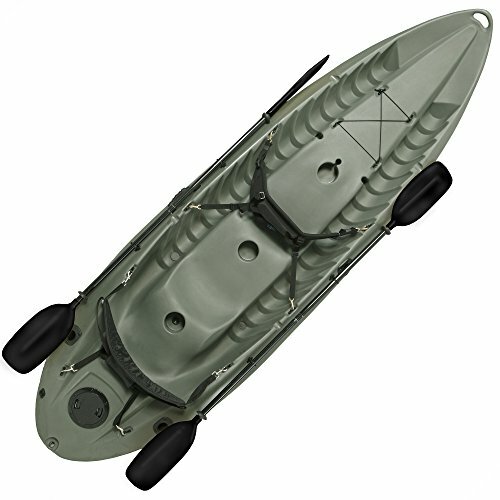 Like most of the other kayaks on this list, the Lifetime 10 Foot Sport Fisher Tandem Kayak is a sit-on-top kayak. The weight capacity of this kayak is quite high, making it a good choice if you have a pup of a larger breed. While you are able to seat three people in this kayak, it is better to go just yourself and your dog. This kayak is stable and comfortable. 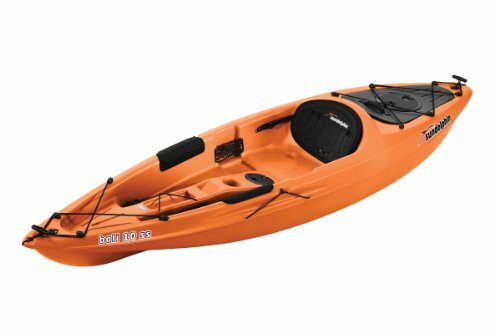 The Ocean Kayak Malibu Two Tandem Sit-On-Top Recreational Kayak is able to accommodate two people and one small dog, or one person and one large dog. This kayak does well on placid lakes, as well as on choppier waters like rivers. This kayak can hold up to 425 pounds (or 193 kilograms), which makes it perfect for those with bigger dogs. This kayak has a large beam so it is incredibly steady. 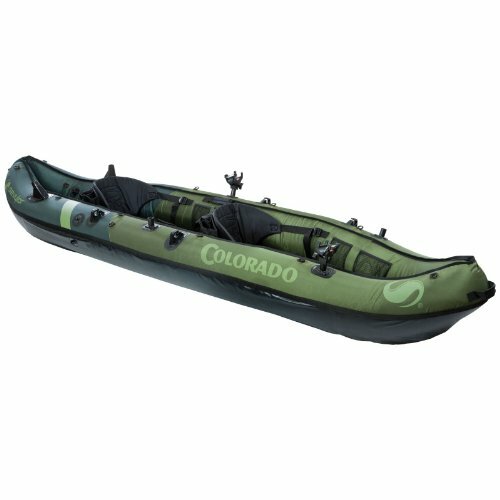 The Sevylor Coleman Colorado Tandem Inflatable Kayak is the perfect kayak for one adult and a large dog. This inflatable kayak only weighs 37 pounds (or 17 kilograms), but can hold 370 pounds (or 168 kilograms). As well as being able to hold a lot of weight, this kayak is also very stable, a must for dogs. This kayak has built in handles, which makes the kayak easier to carry, which is good as your dog probably won’t help you with this! 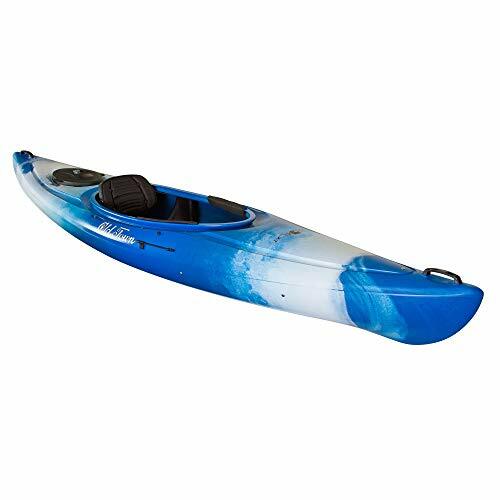 The Old Town Canoes and Kayaks Heron 11XT Recreational Kayak is perfect for you if you and your furry friend are just starting out on your kayaking adventure. This kayak is eleven feet long but weighs only 49 pounds (or 22 kilograms), so it is quite easy to transport by yourself. The cockpit of this kayak is quite large, which is good as both you and your pup will be sharing it! The Sun Dolphin Bali SS Sit-On-Top Kayak is really easy to get in and out of for both you and your dog, meaning that if anything was to ever go wrong, you are your best friend can get out safely and quickly. The beam of this kayak is 30 inches (or 76 centimeters), making this kayak very stable, which is good for the more excitable, boisterous pups! Another sit-on-top, 30 inch beam wide kayak, the Perception Kayak High Life 11 is incredibly stable, which is a really good and safe choice if you have a large dog. This kayak does well on lakes, rivers, and even in the ocean, so if your dog is comfortable in those waters, the sky is the limit! There are many factors that need to be taken into consideration when choosing the right kayak for getting onto the water with a dog. Dogs are not as predictable as human kayaking partners, so you need to think about the safety of you as well as your lovable pet! How comfortable do you need the kayak to be? Looking into adjustable seats and the like could make your day on the water with your furry friend a lot more enjoyable for the both of you! Now that you’ve found the perfect kayak for you and your dog, you should look into a few safety accessories. Dogs are very capable and tough creatures, but you want to make sure that they are totally comfortable and that you have the right tools for any situation that may arise! A Lifejacket; while most dogs are comfortable and able swimmers, dogs will also get tired and choppy waters will be difficult for them to navigate. Make sure your pup is as buoyant as possible! These life jackets also tend to have a handle on the top (or on the part that covers the back of your dog), so if your dog is smaller you can actually lift them out of the water, or if they are larger you can pull them towards you or direct them. A First Aid Kit for Dogs; first aids kits for dogs are available as is, or you can put together your own. Make sure that your kit includes and emergency blanket, absorbent gauze, scissors, tweezers and an ice pack. Sunscreen for Dogs; sunscreen may be something you do not equate with dogs, but your dog’s nose could very well become burnt during your day kayaking in the sun. A Harness and Dog Leash; you do not always have to have your pup on the leash, but it is definitely a great idea to have it in the kayak with you just in case! It may also come in handy when guiding your dog into and out of the kayak. Below we have compiled a short list of things to consider to ensure that you and your beloved pet have fun out on the water! Check with your vet before you head out; be sure to discuss the area in which you are going to be kayaking, as there may be risks of water-borne parasites. Your vet will also be able to direct you to some dog CPR training and safety courses that will be immensely helpful! Spend some time becoming familiar with the kayak; before heading out onto the water, let you pup get used to the kayak. Allow your dog to walk around in the kayak and get used to sitting in their seat. When your dog is comfortable with this, try getting your dog to just walk around and sit in the kayak in still, shallow water. Begin kayaking with your furry friend on very still waters; when you are starting out tandem kayaking with your dog, do not start on rough or strong waters. Your dog could get spooked and it is potentially very dangerous for you both! Be prepared for your trip; make sure you pack all of your safety gear, that we mentioned above, as well as a water bowl and water, snacks and even toys, so that all of your pup’s needs are taken care of. Training your dog to get into and out of the kayak; while easy for you, getting into and out of the kayak will be very new to your pup! It is advisable to train your dog to jump in and out of the kayak on dry land first, then to move onto getting in and out in calmer waters. It is important to have your dog feel comfortable doing this! Be mindful of when your dog has had enough; Your endurance and the endurance of your pup may be very different. You might be having the time of your life, but your dog may get tired much easier. Make sure that you are listening to the needs of your best friend and quit when they are exhibiting signs of fear or fatigue. Why Are Kayaks Different Lengths? What Are Kayaks Made Of? What Muscles Do You Work When Kayaking?